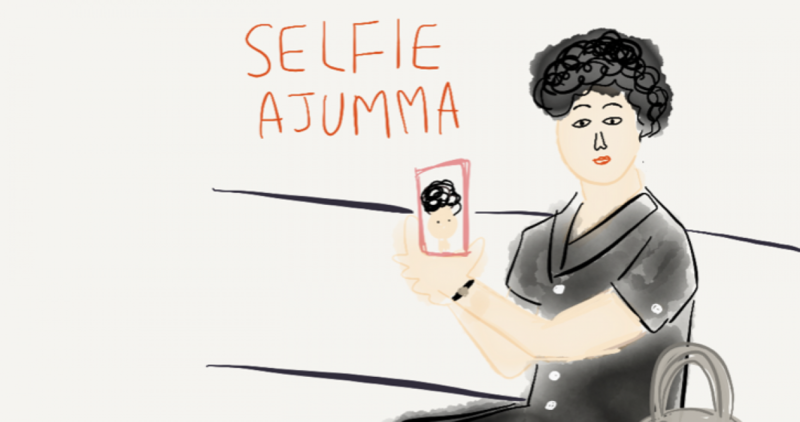 Anyway, Lee’s Ajumma-Selca is about a tiring and tedious (or sometimes enjoyable as well) daily life of ajummas. She put the wooden-ajumma doll in the situated frame (e.g. kitchen) of photos to reflect her (or other ajummas) lives. Thus, the each photo is a sort of ‘ajumma-selca’ that shows ajumma-selves through a wooden ajumma doll. Posted on 13 Jun 2016 13 Jun 2016 by moon ajummaPosted in 스마트 아줌마 (한국어), Smart Ajumma (English)Tagged ajumma, Ajumma-Selca, Exhibition, Incheong Lee, Installation art, Korea, Korean women, photography.